"Take Me Away" was originally released in 1989 with several original mixes, including some by Santonio & Pennington. The song became a UK club & rave hit in 1991 when remixed by Pin Up Girls, leading to releases gathering the old & new mixes together. The artist names on releases and on compilations & mixes are not consistent; some use Bridgett Grace, some use the producers (Final Cut with True Faith), some use Pin Up Girls, and some use combinations of these names. 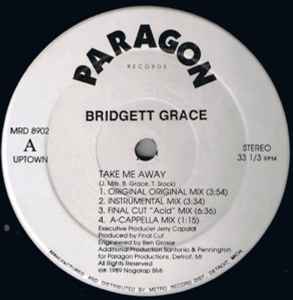 The Pin Up Girls remix of "Take Me Away" also appears on a 2008 split 12". Side A is so much louder than Side b it's unbelievable. Hey I see many different versions of "Take Me Away". I see Final Cut with True Faith and now Bridget Grace's version. Are these mixes the same between the two or different? A superb collection of remixes of this stone cold classic - even the acapella. More or less a must-have for house fans. The ultimate original version that contains the bass line and acapella as sampled in the Pin Up Girls Bootleg. The is the original 1989 Detroit 12" release of 'Take Me Away'. Forget the other popular, cheesy UK bootleg versions (you know the ones! ), this is the only one you need in your collection. Right back at the start of the 1990's Carl Cox was playing this along with all the other big name Dj's. Originally released as the Pin Up Girls and later signed to Network this is an old skool anthem that should be in everyone's collection.